GM LS Engine Rocker Arm Pivot Trunion Kit for Chevy 4.8L 5.3L 6.0L 7.0L Cadillac. 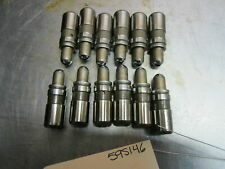 16 Pieces Rocker arm trunnions- LS-type retrofit. 32 Pieces Rocker arm bearings- LS-type retrofit. 32 Pieces Rocker arm Larger retaining rings- LS-type retrofit. ROCKER MOULDING CLIP WITH SEALER. Stem Length. Replaces part No. Manufacturer Part Number RA954. Engine Rebuild Kits. Head Gasket Set. Head Bolts Sets. Rush My Parts will not be responsible for any labor, towing, fluids, Freon, filters, lodging, and car or truck rental. 100% TOYOTA GENUINE PRODUCT. WE ARE ALSO NOT RESPONSIBLE FOR ANY LABOR EXPENSES, TOWING EXPENSES OR RENTAL CAR EXPENSES CAUSED BY THE USE OF WRONG OR DEFECTIVE PARTS DURING INSTALLATION. ORDERS DISPATCH TIMINGS 02:00 PM TO 7:00 PM ( 4:00 HRS GMT). BGA is the aftermarket division of the British Gaskets Group. A world leading original equipment gasket and engine component manufacturer.BGA’s mission is to supply the world aftermarket with a full range of OE quality engine components. Our ranges are some of the best in Europe with a total of over 33,000 references. BGA Rocker Arm (Engine Timing). Search “BGA Online Catalogue”. Any information in the compatibility table is for reference only and there may be unspecified choice options. Labour claims & consequential loss claims are never accepted. Part Number: FOL198. Safety & Workwear. Royal Leisure. Site Safety. Office Supplies. Catering Supplies. Janitorial & Hygiene. Tools & DIY. 16 rocker arm trunnions- LS-type retrofit. 32 rocker arm bearings- LS-type retrofit. 32 rocker arm Larger retaining rings- LS-type retrofit. They include the rocker arm trunions, rocker arm bearings, and rocker arm retaining rings for a complete installation. Manufacturer Part Number 422 0131 10. Use engines info and vehicle YMM compatibility chart for general guide. Strictly important to provide VIN along with your detailed request since there can be different options for your car specific tech characteristics. Manufacturer Part Number 266909. Use engines info and vehicle YMM compatibility chart for general guide. Strictly important to provide VIN along with your detailed request since there can be different options for your car specific tech characteristics. Rush My Parts will not be responsible for any labor, towing, fluids, Freon, filters, lodging, and car or truck rental. - New Arrivals. - Add to Favourites. Quick Links. BROWSE MORE CATEGORIES. Motor Mount Sets. Fit For Lexus LS1 LS2 LS3 4.8 5.3 5.7 6.0 6.2 LS Rocker Arm Upgrade Trunion Kit. 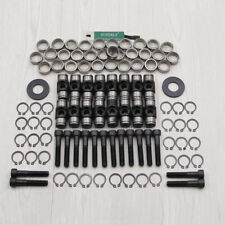 -Type:LS Rocker Arm Upgrade Trunion Kit. 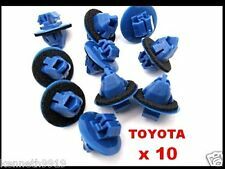 For Lexus LS1 LS2 LS3 LS6 L99，LS4，LS7，LS9 LSA LQ4 LQ9 L76 L92 LR4 LM7 L59 LM4 L33 L98 L77 LY6 LFA LZ1 LY2 L20 LMF LH6 LY5 LMG LC9 LH8 LS4. Model: RX350. RX350 10-15 (3.5L, VIN K, 5th digit, 2GRFE engine), w/oil cooler. Make: LEXUS. Year: 2010. No crankshafts are sold that need to be ground. Notes on Crankshafts. Most cylinder head bolts are torque to yield. Benötigte Stückzahl: 16. KBA: 5013ADX benötigte Stückzahl: 16. KBA: 5013AIB, 5013AIE benötigte Stückzahl: 16. KBA: 5013ADY, 5013AFM benötigte Stückzahl: 16. KBA: 5013AFF, 5013AFH, 5013AFW benötigte Stückzahl: 16. Artikelnummer: 420 0239 10 Hersteller: INA EAN: 4005108591876 Betriebsart: hydraulisch, Außendurchmesser [mm]: 12,00, Höhe [mm]: 32,60,. INA 422 0131 10. TOYOTA AURIS (NRE15_, ZZE15_, ADE15_, ZRE15_, NDE15_) 1.33 Dual-VVTi (NRE150_). TOYOTA AURIS (NRE15_, ZZE15_, ADE15_, ZRE15_, NDE15_) 1.6 (ZRE151_). TOYOTA AURIS (NRE15_, ZZE15_, ADE15_, ZRE15_, NDE15_) 1.6 VVTi (ZRE151_). Model: 422 0131 10. Manufacturer: INA. We will give you proper part number for needed spare part. EAN: 4005108589385. Model: 266909. Manufacturer: RUVILLE. Custom or special orders. IPD 45-4257. We will give you proper part number for needed spare part. Artikelnummer: 266909 Hersteller: RUVILLE EAN: 4011442048549.